Happy New Year, everyone! Dana asked me yesterday, “When are you going to update your blog?” And I suddenly felt convicted. It’s been hard for me to regroup from the holiday break. Plus, I’m not sure I have much to say just yet; still searching for my 2009 voice, I guess. Maybe another reason I’ve avoided blogging is that I’m so darned embarrassed to live in Illinois right now. After Governor Blagojevich’s arrest and tragic downfall, I thought the guy would keep a low profile and not stir up anymore trouble. Alas, Blago’s ego wouldn’t allow him to keep still. And so, last week he goes and names Roland Burris, a veteran African American politician, to fill Barack Obama’s vacant Senate seat. You all know the rest. Now, this week we have the fiasco of Mr. Burris going to Washington for the swearing-in ceremony and being turned away. We’ve got black politicians and church leaders in Illinois declaring that Burris has a legal right to the seat and should be allowed to fill the vacancy because there are currently no African Americans in the Senate. We’ve got President-elect Obama, Illinois Secretary of State Jesse White, Senator Harry Reid, and an assortment of other folks saying Burris should not be allowed to join the Senate because of the cloud of corruption hanging over Blagojevich’s governorship. And on and on it goes. Ironically, the last power play for this particular Senate seat also involved a brazen dealing of the race card. Remember back in 2004 when Illinois Republicans recruited Alan Keyes, an outspoken African American conservative from Maryland, to come to the Land of Lincoln and battle Barack Obama for that U.S. Senate seat? I never thought I’d see such an outrageous display of racial politics in Illinois again—until now. So, what do you think? As you might expect, there are plenty of interesting commentaries floating around the blogosphere and other media. Monroe Anderson, at EbonyJet.com, sarcastically quips, “[A]pparently, the [Senate] seat that once belonged to the president-elect now commands exclusive dibs from black pols in Illinois, period. No whites need apply. Asians or Hispanics shouldn’t bother either.” In an interview with NPR, Ta-Nehisi Coates of The Atlantic also argues that race shouldn’t matter in the Burris case. And Chicago Tribune columnist Clarence Page offers an insightful overview of the current saga in all its racialized messiness. I was one of the student speakers at the 1988 baccalaureate service at Auburn High School in Rockford, Illinois. One of the other scheduled speakers unexpectedly couldn’t make it to the service, so I ended up going last. I started my speech by congratulating the Class of ’88 (full disclosure: I should’ve graduated in ’87 but was held back in the fourth grade). Then I shared a little about my faith in God, performed an updated version of the parable of the Prodigal Son, and concluded with a reading of “Twas the Night Before Jesus Came.” It was well received, and I recall many people were moved by the service. But 20 years later, I’m having second thoughts. As I reviewed “Twas the Night Before Jesus Came” the other day, in preparation for a reading at a work Christmas program, I was struck by how harsh it must’ve sounded to some of the people in that Auburn High audience back in ’88. Thinking back on that event, I honestly don’t think I recited it with a spirit of judgment or condemnation; I simply wanted to impress upon my classmates and teachers our need for salvation through Jesus Christ. In retrospect, if I had it to do over, I don’t think I’d use that poem. Instead, I think I’d want to share something that spoke more of the love, mercy, and grace of Jesus Christ. Maybe I’m getting soft in my old age. Or perhaps it’s just that I see more clearly my own desperate need of God’s mercy and grace. In any case, rather than the “fire and brimstone” treatment, I’d like to leave folks with a glimpse of God’s great love. Certainly, “Twas the Night Before Jesus Came” is a clever little piece, playing off of Clement Moore’s classic story. Jesus is coming again someday, and the poem is a jarring reminder to get ourselves ready. Still, I wonder if there might’ve been a better way for me to share my passion that night. Many of the people in the auditorium that evening didn’t so much need to hear about the Second Coming of Christ as much as they needed to hear about his First Coming—how God loved us so much that he humbled himself to become a man so that he might save us from our sins and give us new life. On this Christmas Eve, as I think about God’s wonderful gift to us, I pray that we’ll all experience his love and grace anew. Merry Christmas, everyone. It’s not a great time to be from Illinois. Yesterday a friend of mine, a native Chicagoan who now lives in New Jersey, IM’d me with this: “Geez, what’s wrong with your politicians out there?” She seemed to happily forget that she, too, is from the Land of Lincoln (and Blagojevich). Governor Rod Blagojevich’s alleged actions have left everyone feeling either sad, mad, or stunned. Why on earth would someone who has been the subject of Federal investigations for the past five years attempt to “sell” a U.S. Senate seat, among other things? The astonishment and hyperbole that’s been used to describe this latest scandal, from the mouths of Federal investigators who have seen plenty of corruption, speaks to the tragic and unfathomable nature of these events. My first reaction was to call the guy a “total idiot.” How could he be so stupid, greedy, and vindictive? This bum needs to resign—or be impeached—sooner rather than later. Lock up he and his “pay to play” political cohorts. But then I saw video of his wife and two young daughters walking out of their home on the news, and I was reminded of his humanity. And I thought, Lord, have mercy on this man and his family. Then I started to think about my own instances of actions that border on unethical at best and illegal at worst. Aren’t we all engaged in some manner of “You scratch my back, I’ll scratch yours” behavior from time to time—in the workplace, in our personal relationships, in our finances? Which led me to think, Lord, have mercy on me. I haven’t had time to read many commentaries on this scandal yet, but I did find Eric Easter’s comments over at EbonyJet.com quite challenging. Easter asks the question, “Are we all corrupt?” And suggests that there may be a thin line between what Blagojevich was doing and stuff that we do each day. Gov. George Ryan: Throw Away the Key? I’m always a little intrigued by how easy it is for us humans to instinctively demand justice, yet how deep we have to dig in order to muster up any inclination toward mercy or forgiveness. What’s up with that? I understand that God has wired us with that desire for righteousness, to see “the crooked made straight and the rough places plain” (Isa. 40:4). But I also know how much trouble we get into when we presume to dispense judgment without mercy. Wouldn’t it be something if, instead of righteous indignation, our first instinct was one of grace and mercy? What would that look like? I say all this because I’ve been fascinated by the response to a situation here in Illinois. 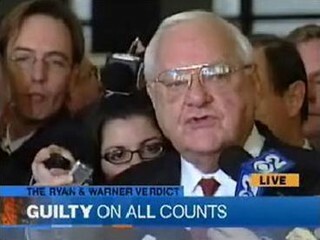 Many of you probably know that our former governor George Ryan was sentenced to a six-year prison term for a variety of corruption charges that stem from his tenure as secretary of state. Probably the most notable and tragic result of Ryan’s crimes were the deaths of the six children of Scott and Janet Willis, who were killed in a fiery traffic accident caused by a trucker who obtained his driver’s license illegally from one of Ryan’s secretary of state offices. Consequently, many people view Ryan as an accomplice to murder. For this, Durbin has taken a major lashing from the public. On the Chicago Tribune website, one commenter opined, “Whatever good opinion I have had of Senator Durbin has just diminished to zero. He has just added to the belief that politicians stick together no matter what the crime. It is time that they not be considered untouchable where justice is concerned.” Responding to the criticism, Durbin said he had been “raised in a tradition of redemption” and that he believed Ryan has already paid a great price. However, the overwhelming majority of folks seem adamant that Ryan should not be given any special treatment. Again on the Tribune site, in a survey that asks: “Should President Bush set Gov. George Ryan free?,” out of 1,977 respondents (when I last checked), a whopping 1,617 said “No,” while only 360 folks said “Yes.” That’s 82% whose natural and abiding impulse is to go by the letter of the law versus 18% who think the old guy has suffered enough. Ironically, Gov. George Ryan’s other great controversial act was the moratorium he placed on Illinois’s death penalty because of several dubious cases where individuals were unfairly tried. Then, before leaving office in 2003, Ryan commuted the death sentences of every inmate on Illinois’ Death Row—167 in all—to life in prison. What do you think? What’s the proper balance between mercy and justice? Would commuting Gov. Ryan’s sentence send the wrong message, or would it send exactly the kind of message our society needs to witness more of—one of compassion, forgiveness, and grace? Because it goes against human nature, forgiveness must be taught and practiced, as one would practice any difficult craft. “Forgiveness is not just an occasional act: it is a permanent attitude,” said Martin Luther King Jr. What greater gift could Christians give to the world than the forming of a culture that upholds grace and forgiveness?